Skender, serving as base building and interior construction manager, has broken ground on North Shore Place, a Senior Lifestyle-owned assisted living facility located in Northbrook, Illinois. This marks the second new construction project Skender has completed for Senior Lifestyle on this property; the first a 175,000-square foot, five-story, 157-unit assisted living facility located adjacent to current construction. 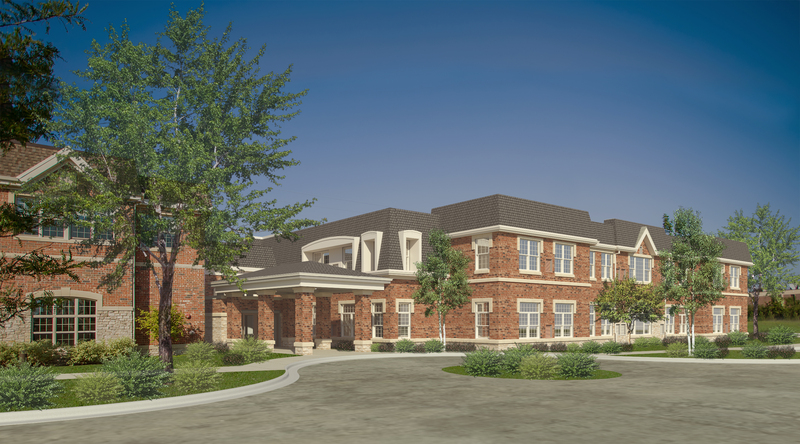 The new two-story, 74,000-square-foot assisted living facility will offer 38 memory care units. Special infrastructure will allow for the installation of a video memory screen adjacent to every tenant’s entryway door that cycles through digitized photographs of family and friends to assist tenants with room identification. Once the new building is complete, Skender will convert the former memory care wing into 30 assisted living units. All work is being performed adjacent to a fully operational, twenty-four seven facility and requires shut down of the main access drive for building deliveries and egress. Skender is working in collaboration with design firm SAS Architects & Planners, civil engineering firm Manhard Consulting and structural engineering firm Bowman, Barrett & Associates to successfully complete the project in 10 months followed by a four-month conversion of the existing North Shore Place facility from memory care to assisted living.